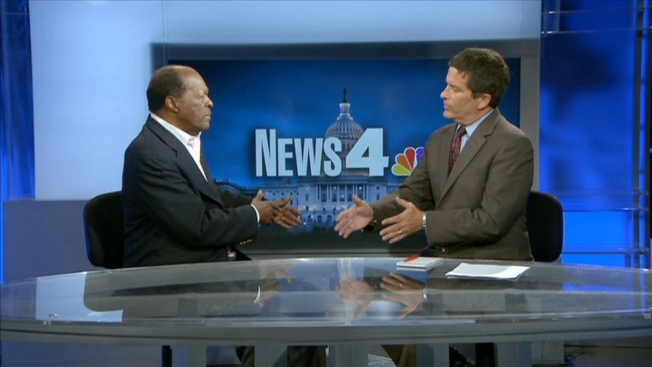 Marion Barry's infamy lives in the words that people wrote about him. Lurid stories of indiscretions during his tenure as mayor of D.C. have secured his celebrity status within the Beltway. But with the release of his autobiography, "Marion Barry: Mayor For Life," he is now telling that story in his own words -- and defending his legacy. Barry explained his decision to finally have his say with News4's Mark Segraves. "The problem is, it's been about what Marion Barry is, not who he is," said Barry, who served four terms as mayor and is now the city's Ward 8 councilmember. "But what about who Marion Barry is? What are the kind of things that influenced his life?" Barry explained that the key tenet of his book is about overcoming struggles and a difficult upbringing. Barry was raised in Mississippi by his mother, who was a domestic worker. He said that he got his activist spirit from her. He also said he had high hopes for his book. "This book ought to be educational, it ought to be informational and it ought to be inspirational," he said. The book, which debuted Tuesday, comes in advance of a proposed HBO adaptation of Tom Sherwood's book about abuses of political power in the nation's capital during Barry's reign, "Dream City." "Some Marion haters like to talk about all the negative stuff," he said. "People who live in Washington know the truth about all the incredible stuff I've done as mayor. I've overcome all kinds of rumors and corruption and not proven them to be true." Segraves pointed out that the autobiography is honest, to the point of being shocking. He alluded to a passage in which Barry describes his first cocaine use, comparing it to a sexual experience. "I was honest in this book," Barry replied. "No one can read this book and say that Marion Barry was not honest." Segraves raised the most infamous of Barry's indiscretions, an undercover sting that saw Barry arrested on charges of crack cocaine possession at the Vista International Hotel in 1990. Barry apologized to his family, to the people of D.C. and to Rasheeda Moore, the woman who was found with him at the time of his arrest, and said that she was "a victim too." "We are a country and society of second chances," said Barry. "I have asked for forgiveness and have been given forgiveness many times by the people of D.C., by God. That's what I want to talk about." Barry gave his take on the Vista International incident too, positioning it as him against the federal government. "The issue about the Vista is overcoming, the issue about the Vista is tenacity and courage and strength overcoming the entire federal government," he said. Barry went further to explain that he felt unfairly maligned at the time because of his success in generating income for African American-owned businesses in D.C. One of Barry's greatest successes may be the U Street area; the 1968 race riots caused damage that went unrepaired for decades, but Barry commissioned the Frank D. Reeves Municipal Center in 1985. It was credited with sparking a revitalization in that area. The Reeves Center is proposed to be redeveloped as part of a land deal to build a new stadium for D.C. United. Barry acknowledged that poverty is still a big problem for many communities in the city and across the country. "Why do you expect Marion Barry, as good as I am and visionary as I am -- and God gave me many gifts -- to solve that problem?" he said. "My job is to be the Paul Revere and let people know about this terrible condition we are living in America, in 2014." But despite those issues yet to be solved, Barry seemed confident that his legacy has been a positive one. "If you look at Washington D.C., there's hardly anyone that lives here that has not been helped by the policies of Marion Barry," he said. Despite his legacy, Barry was reluctant to talk about any further forays into politics. "I'm not about politics, not now in my life, my life is about humanity." The book is available today in bookstores and online and copies are available from the D.C. public library system. You can watch the rest of Segraves' interview in the video above. As to the content of the book, Barry was eager to impress that it contains his whole life, and not just the stories that Washingtonians may already know. "My life is much longer than that. Look at me, Marion Barry. All chapters. All nine innings."